Keep it classy with Star Wars and the Rebel Alliance! 100% Italian Silk Pocket Square features a cool Rebel Alliance symbol pattern. Measures 11-inches tall x 11-inches wide. Keep it classy with Star Wars and the Rebel Alliance! 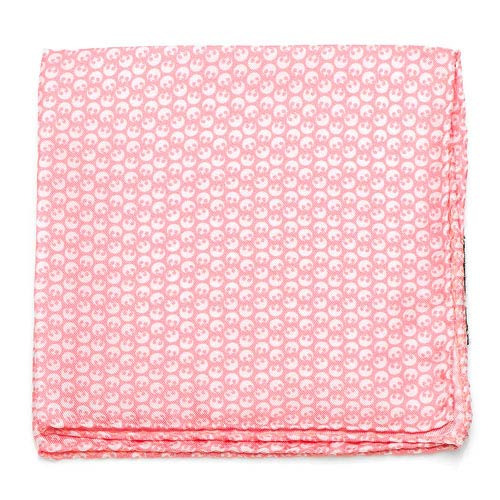 This Star Wars Rebel Alliance Pattern Pink and White Italian Silk Pocket Square measures 11-inches tall x 11-inches wide and is made from 100% Italian Silk. Featuring a pink base color with a pattern of Rebel Alliance symbols decorating it in white, this handkerchief pocket square is a must-have for Star Wars fans who are in need of some nice formal wear. You'll be able to attend any stuffy event decked out in the coolest geek gear - all while being able to keep your love of Star Wars a subtle secret for anyone who isn't taking a good look at your attire! Ages 14 and up.